I met Al Andrews several years ago at a World Vision Artists Conference. He may not remember me, but he had profound impact on my life. Al is a kind and gentle soul. He is also a counselor in Nashville who has made himself available to touring musicians…free of charge. The insights Al shared in the breakout sessions we attended were profound for Pam and I. He gave words to things we were experiencing and insight into some of the challenges we faced in our marriage specific to life on the road. Pam and I talk of Al often and with great appreciation and fondness. His words have been a huge encouragement to us. So let me introduce you to a project that Al has launched. He has written a children’s book called The Boy, The Kite and The Wind. His dream is to see this book sell millions of copies so he can give that money away and help people living in poverty around the world. It’s a big dream, but big dreams lead to big things…Al calls it radical generosity. I’m excited to see what will happen. The first major goal in publishing this book is to try and pre-sell 5,000 books by March 15th. I’m hoping that all of my readers will get involved and buy a copy. The reviews of the book are glowing. You can easily pre-order your book by clicking HERE. 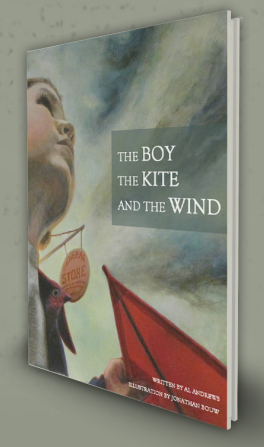 Check out this video with the story from The Boy, The Kite and The Wind. How did the story impact you? Have you pre-ordered your copy yet?